Make an anniversary, milestone, or birthday even more special with this unique personalized gift. Make an anniversary, milestone, or birthday even more special with this unique personalized gift. Encased in a premium green leatherette cover are authentic news articles that chronicle the major events from the date of your choice as well as front pages from all birthdays or anniversaries after. The book also features blank pages between each front page, ready to be filled with your photos and messages. Make this gift even more meaningful by adding a personalized message (up to 150 characters) and a full name (up to 22 characters) inside. Made in the United Kingdom. Please note: If a newspaper does not exist for a particular date (if, say, newspapers weren"t published on this date or the date was in the period of strike), the following day's front page will be used. Total page count will vary depending on the year selected. Has such interesting information in it. The whole family got some good laughs out of the headlines too. 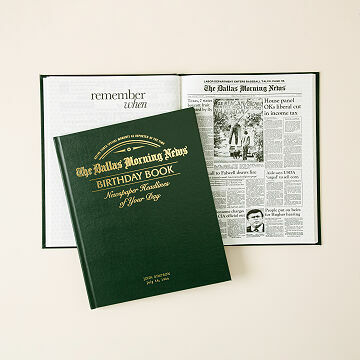 The Dallas News Custom Birthday Book has a 20 page minimum, so only dates prior to today's date in 1997 or earlier can be ordered at this time. The most current date available is the date on which you place your order.